This is the ultimate invitation for a rustic, country wedding. 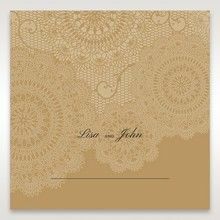 The intricately embossed and laser cut floral pattern is lace inspired and combined to create a stunning card that will simply take your breath away. When opened, this tri-fold card reveals our signature thermographic lettering on a quality insert that is equally rich in texture. Not only will you be amazed but your guests will be too, appreciating the effort that has gone into hand crafting this luxurious invitation. 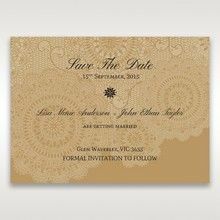 The luxurious gold foiled stamped wording ‘Marriage Wedding Invitation’ on the bottom right of the card cannot be removed or altered. Beautifully crafted invitation, simple yet elegant and matches the theme of our wedding which is rustic romance. The cover is visually stunning with the laser cut detail. Very happy with the embossed lettering and overall style of this card, it definitely has the wow factor without being over the top. Really liked the matching envelope as well. Giant Invitations has great attention to detail and the quality of the product is excellent. Giant Invitations have a fantastic selection of products compared to some of the other online sites. You have an extensive array of unusual invitations available. We love this Rustic Charm front and inside plus the collection of the optional extras that match the selection. It is great that we can choose our individual font and wording . We are very pleased that you offer proof reading and a sample as this is essential.Thank you. A very beautiful looking card and the sample we received was just what we wanted and sealed the deal. I have ordered these for our upcoming wedding and can't wait to receive the final versions. It was also a pleasure dealing with the staff who were helpful and made the ordering process as well as getting the samples painless. Keep up the great work and I will certainly be browsing through your cards for any future events. My invites were absolutely beautiful. The process from start to finish was so easy. The team at Giant Invitations are a delight to deal with. Expect your queries to be dealt with in a prompt and efficient manner. You can also expect to receive your digital proofs fairly quickly. Not to mention the website is user friendly making your online ordering experience a breeze! I am definitely coming back here to order my wedding invites! We ordered the Natural Charm Save the Date Cards and they are just beautiful!The website is very user friendly. We are very happy with the quality of the cards. We would happily recommend Giant Invitations to anyone looking to print their invitations for their special event as the process was very easy to follow. We recommend visiting their studio as it offered lots of wonderful ideas and insights, with very helpful staff. I ordered some sample invitations and save the dates from Giant, including this design and I was very impressed by all of them. The samples arrived quickly and were of very high quality. The textured card used for this design is very nice and the foiling looks beautiful. 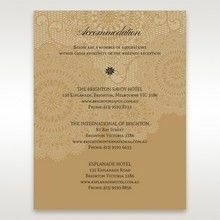 The thermographic printing also looks great and adds a little something extra to the invitation. I was also very happy with the envelopes and their shiny insides. 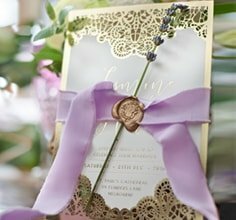 The invitation and matching save the date in this design look even better in person than online, they are just exquisite! I would highly recommend this design. Giant have also been very good to deal with, I have used the online chat quite a bit and they are always so fast in replying. Giant Invitations have been amazing to deal with in organising my wedding invitations. I went in to speak with them twice before making an order (which I recommend) and they were so helpful and accommodating. They answered all of my questions, provided suggestions when needed and explained how the process worked and what would work well and what wouldn't. Placing the order with them has been very easy! This new design is a classic and classy wedding invitation. The overlook quality was excellent. Very well finished and the paper was off top quality. The invite is great value and the design is elegant and understated. There was a great selection of customization as well so we could personalise to our liking all the way down to the sealing stamp. Ordered a sample and now we will be ordering for our wedding invites. My favourite!!!! 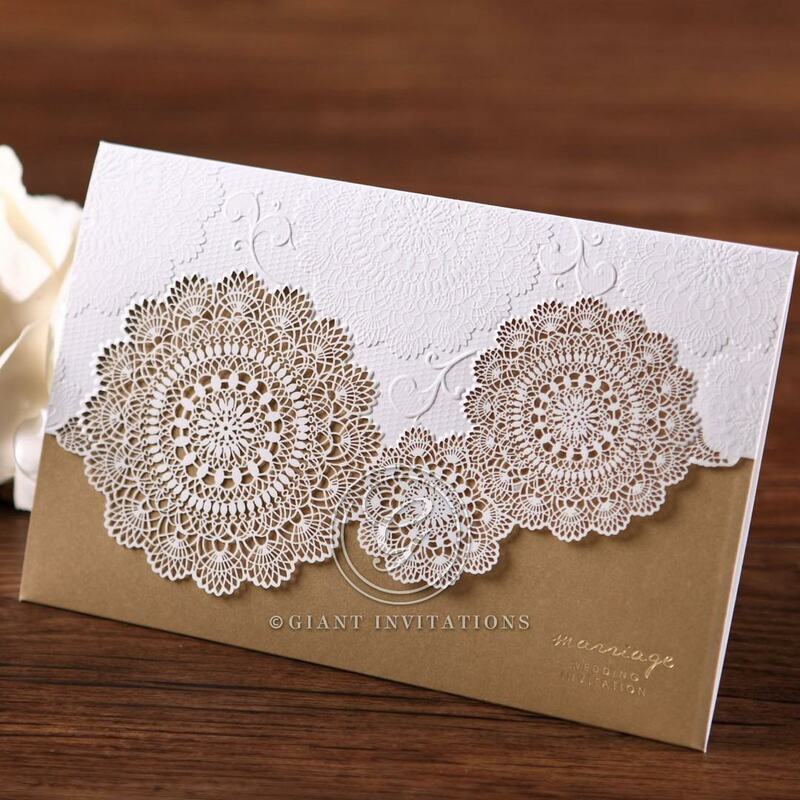 Love everything about it from the design in front to the inside body of the invitation which is simple yet elegant. I have forwarded your website and services to my friends and family.! They were beautiful, thanks so much! And everyone loved them. Great product and great service and I've spread the word. Much appreciative of the work on the edits to make sure we knew what was arriving in the mail! Today I got my samples and they are absolutely beautiful! I will order them for my wedding. Thanks to all at Giant for expedient and great service and products. 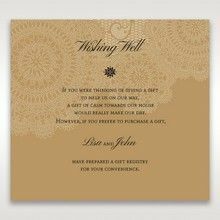 At first I was hesitant about online invitations.. but this website made it all so easy and affordable I couldn't resist. 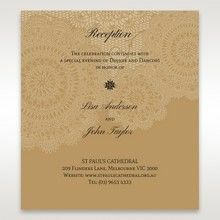 Laser cut invitation and free registered post delivery. Very happy! We are very impressed with this invitation. Looks great, sample has been delivered next day. The guy in chat was very helpful. Wish all businesses will be like this one. Great job, guys! thank you for the beautiful invitations, they were even more beautiful in real life. From myself and Scott, we would like to say a MASSIVE THANK YOU to Giant Invitations!! We were SO IMPRESSED, by everything throughout the whole process.I got recommended to Giant Invitations by my best friend Britt-Anna who used you, and early on in the year I ordered some samples for myself and they were great!When it came down to ordering the ones I wanted they were unfortunately out of stock, however I ended up choosing ones I hadn’t had a sample of and thought they still looked nice even though second preference...and then when I picked them up…WOW they were AMAZING! (better than the ones I first wanted! )Absolutely LOVED them! They were so beautiful, and we have had so many comments on how good they are from our guests. The whole process, from being on the site and being able to chat online, and chatting to ladies on the phone.And when receiving the proofs how easy it was to change things and see what it looks like. And being able to have the ability to make some changes. How quickly the turnaround times are, and also how great quality they were! Very impressed, and so thankful I went through Giant Invitations and I have and will certainly be recommending Giant Invitations to anyone! (and use again in the future)LOVE LOVE LOVE THEM!! The invites were just beautiful and you guys were very professional which I appreciated. I cant wait to use them for my wedding. Beautiful invite. Love the high end quality and details. I just got my sampleand it was really great quality, very impressed! These invitations are absolutely gorgeous and the quality is amazing. I cannot thank Giant Invitations enough, you have done an amazing job and all at such fantastic prices as well. I will highly recommend you! A big thank you that they are received, all is great and the feedback has been very positive. People love the invitations.So in all, I am happy with everything. I absolutely LOVE this product sample. 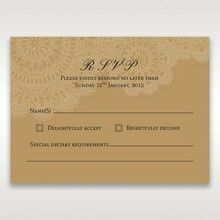 I cannot wait to finalise the guest list to be able to then submit my order for invitations. I could not be more pleased with the craftsmanship and quality of these invitations! Very happy with this beautiful invitation. 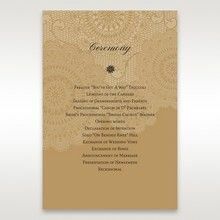 The design and printing of the invitation is high quality, and comes with beautiful envelopes and seals. 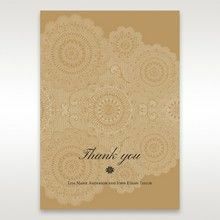 The staff at Giant Invitations were pleasant to deal with, and turn around time for our order was amazingly efficient. I have recommended Giant Invitations to our wedding event coordinator as well as to our friends and family. Keep up the great work! We ordered this invite as a sample and it is just sooo pretty. The intricate detail on the front is really special. 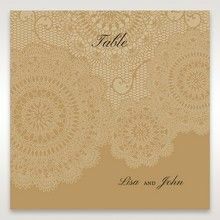 With the colouring I would say perfect for a vintage/rustic wedding that still wants their invitations to be classy. Very happpy with the sample tri-fold laser cut invitation we have received, it looks beautiful and feels luxurious. High quality. Have been very happy with the excellent service provided by Giant Invitations so far, they have been very helpful. Just about to order these as our final invites and I am looking forward to receiving them and sending them out to our guests. Thank you so much for making the invitations so easy! They are exactly what we wanted and our guests are commenting how gorgeous they are, not to mention they were so affordable! Have already recommended your company to my engaged friends and will continue to do so. We are very happy with how they turned out. Thank you very much for our lovely invitations.You and your team did an amazing job. The ordering, the recommendation, being able to change the layout, etc it was such a smooth process that i would recommend you to any other bride to be.My fiend is a wedding planner her in Sydney and I have recommended you already. Absolutely Beautiful!! Received the sample - exactly what I wanted for my invitations! Breathtaking. Ordered samples and four days later ordered the wedding invitations. Couldn't be happier with the process. Received the samples in the mail today and I am extremely pleased with the quality! Will be ordering these for my wedding! My partner and I are very happy with the invites. They came exactly how we expected from looking at the website. Also, the process was smooth and the time for processing and delivery was accurate. I was happy to have you guys replying to my emails quite quickly and even the online support was good.Only one thing that annoyed us was the fact that you couldn't save you work and come back later. Or if you had to refresh, you would also lose your work. We have lost our work many times and I was close to giving up, to tell you the truth. But overall we are satisfied. We have received our wedding invitations and we are very happy with them. I have posted them out already. I would be happy to use your services again and will recommend your company to friends. My partner and I are very happy with the invites. They came exactly how we expected from looking at the website.Also, the process was smooth and the time for processing and delivery was accurate. I was happy to have you guys replying to my emails quite quickly and even the online live support was good.Only one thing that annoyed us was the fact that you couldn't save you work and come back later. Or if you had to refresh, you would also lose your work. We have lost our work many times and I was close to giving up, to tell you the truth.But overall we are satisfied.Thanks for your email, it is good to know that you are interested in our feedback. I hope it helps you improve even more your business. Very beautiful. The cards have a very nice touch to them! I was caught between two designs so I ordered samples. The 'Sand Dollar Laser Cut' was beautiful but this was divine! I love the colour contrast of the inner paper and the laser cut card. I was immediately drawn to the laser cut quill detail of this invitation. I kept the designer's recommendation on font size, color and style and they turned out really nice! I couldn't be happier with my invitations. The laser cut designs are so great, they look amazing! I looked everywhere for invitations to fit the theme of my wedding, Giant Invitations had the best prices and quality!